How does a coral sneeze? Okay, that’s a trick question, corals can’t sneeze. Corals do get sick however, and the coral health team on the 2015 Reef Assessment and Monitoring Expedition is trying to understand how corals react to disease and stress. 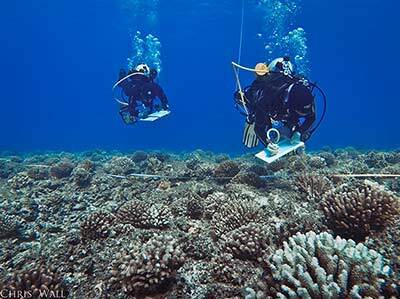 Scientists from the University of Hawaiʻi Institute of Marine Biology (HIMB) and UH-Hilo are studying coral reefs at established monitoring sites across the archipelago to look at coral disease, other signs of compromised health, and recovery from three thermal stress events that caused mass bleaching over the last 12 years. They are also collecting samples of certain corals to understand how they are adapting to stressors, and taking imagery to create 3D spatial models of coral reefs. 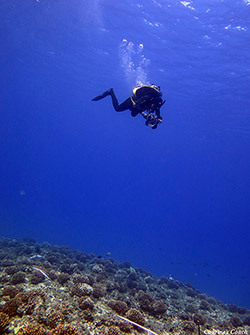 Studying coral health is not an easy task. There are so many interacting factors that affect corals, and knowledge of the underlying causes of disease and how corals cope with repeated thermal stress is still unknown. The three-person team, led by Dr. Courtney Couch, with Kanoelani Steward and PhD. candidate Chris Wall, use a small boat to visit their research sites. Study is challenged by limited access and time at sites, effects of weather on safe operations, and mechanical issues. Fortunately there was decent weather at French Frigate Shoals, Pearl and Hermes Atoll and Kure Atoll, and excellent weather for three days at Maro Reef. 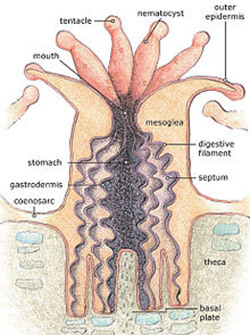 Reef-building corals are relatively simple organisms. They are animals, yet have a symbiotic relationship with algae, called zooxanthellae, that live in their tissues. Zooxanthellae get their energy from the sun through photosynthesis and generate oxygen and sugar as waste products that the coral can use. Corals at light penetrating depths get most of their energy from these symbiotic algae. 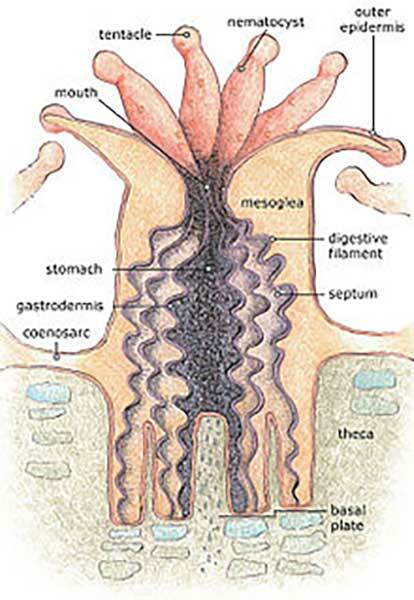 Corals also have tentacles with stinging cells (nematocysts), like jellyfish, and can capture their own food, but they need their zooxanthellae and typically can only survive for several weeks without them. When it comes to disease, corals do not have complex immune systems that can learn and adapt within the organism’s lifetime, like human immune systems. For example, corals cannot be immunized against a disease, like we can. However, corals aren’t completely undefended. They have basic immune systems that can recognize foreign microorganisms, which triggers the release of compounds used to kill these cells and the mobilization of basic immune cells that are a bit like our white blood cells. The coral health team is conducting surveys and observations at existing permanent monitoring sites to study disease in corals and recovery from disease and stress events like elevated water temperatures. When corals are exposed to seawater temperatures above the range that they can tolerate for an extended period of time, they eject their zooxanthellae, and because these algae usually give the coral tissue their color, the corals become white or “bleached” in appearance. 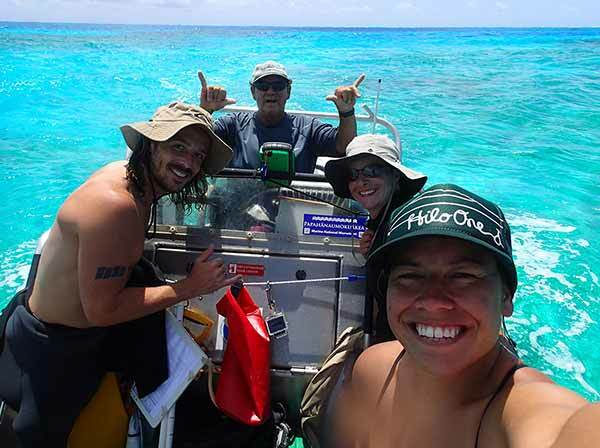 There have been three documented mass coral bleaching events in the Northwestern Hawaiian Islands (NWHI), the most recent event occurring last year, which Courtney and her team documented. This year, the coral health team is revisiting sites that bleached last year to evaluate recovery. While the team has yet to survey Lisianski Island, which saw the worst bleaching last year, recovery at Pearl and Hermes and Midway has been mixed. To the casual observer, corals, algae and live rock that make up a coral reef look somewhat static on the bottom, but when examined over the span of years, great changes in composition are observed. Corals actually fight with each other over space to grow, and algae are only held in check by grazing animals, and the corals. It is like Manhattan real estate, and when one competitor becomes weakened by stress or disease they can be displaced, sometimes forever. At several of the permanent monitoring sites, corals that bleached and died have become overgrown with algae and not recovered. 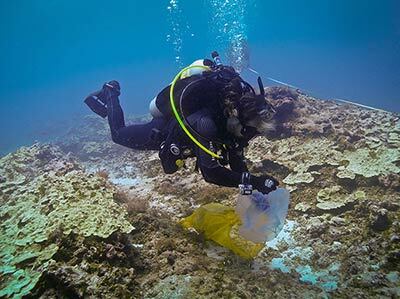 Even in the protected Papahānaumokuākea Marine National Monument, with limited direct human stressors like pollution and sedimentation, corals are having a hard time as the oceans become warmer and more acidic due to human production of carbon dioxide. Another study under the coral health team is being done by Chris Wall from HIMB. Chris is also looking at ways that corals adapt to stress, such as high water temperatures and bleaching events. He is collecting coral fragments from rice coral (Montipora capitata) to look for changes in coral nutrition across habitats within the Monument. One interesting thing he is testing is the effect of turbidity (or water clarity) on coral feeding modes. He thinks that in the murky waters of Maro Reef, the corals may be collecting their food through their tentacles at a higher rate than corals observed in the clearer waters of French Frigate Shoals. Remember that corals have two strategies for obtaining nutrition: the dominant approach is through the symbiotic algae in their tissues, the secondary method is to collect food by extending their tentacles and catching what is floating by – small zooplankton, organic matter in the water, etc. With two ways to eat, corals can change their behavior based on what is best – if there is less light and more food floating in the water, they “hunt” more; if there is more light and clearer water they rely more on the zooxanthellae. Corals also rely more on the hunting method when they are stressed, or bleached, and when they are recovering from stress. Chris is looking at why this happens, and what differences in the genetics of the coral’s symbiotic algae and habitat characteristics might provide clues in coral nutrition and show differences between different locations. Understanding the adaptive strategies of corals may help in restoring damaged reefs in the future, or at least managing sensitive coral reef areas to minimize human stresses. I was talking to Chris about this late last night while he methodically processed his samples in a circuit of actions that reminded me of a focused person in the gym. He had three processes going at the same time and would cycle through each – pull coral fragment samples from the freezer, cut off a small fragment of coral tissue, add the sample to a DNA extraction solution, place in a vial, add heat in a waterbath. Switching tasks, he would then turn to the water filtration apparatus for filtering collected seawater through a filter to see what was present in the water column at the time, things like organic materials, plankton, etc. After filtering two liters of seawater through the filter using a vacuum pump apparatus, he would wash it with super-pure water, and then freeze the filter. Then he returned back to the coral fragments. Watching this at 10:30 PM was a bit exhausting after waking up at 5:30 AM, having a full day on the water, meetings, dinner, etc., but Chris had the process down and despite the fatigue was able to explain the whole process to me. The final component of the coral health team is a visualization component with imagery collected by Kanoelani Steward, UH-Hilo Marine Science and Hawaiian Studies graduate, under the guidance of John Burns. Kanoelani takes a few hundred photos of the coral reef transect that includes strategically placed reflectors on the bottom. These images, combined with some measurements of distance and height of the reef, are later assembled into a three dimensional image of the reef. This detailed image can be used to study how the physical structure of the reef plays a part in coral health, and how stress events like bleaching affect reef structure, volume and growth patterns. Imagery taken of the same reef over several years can help scientists understand how reef structure changes over time and in response to disease and stress events. All of the studies and observations being conducted by the coral health team are trying to better understand how disease and stress affects different corals, and the coral reef ecosystem more broadly. Improved understanding can help to better manage coral reefs and provide justification for enhanced protections for corals that are more sensitive to stress. This type of management has a long track record on land – greater protection for sensitive alpine habitats, or wetlands for example – but knowledge of marine systems is far behind that of terrestrial ecology, and corals are often treated as a group rather than distinct species, hampering efforts to propose greater protections for certain coral species over others. Protecting all coral reefs would be ideal, but is neither feasible nor practical. However, with enhanced knowledge we can better prioritize limited management resources. Finally, by looking for signs of disease and other indicators of coral stress, we can help to better monitor and evaluate coral reef health and interpret the early warning signs of stress.